Did you know that the weekly cost of feeding a family of four can run from $130 to nearly $300, depending on the children's ages? According to the latest numbers from the U.S. Department of Agriculture, the average monthly cost is much higher, ranging from $563 to nearly $1,300. That's a lot of money spent on food. But buying groceries shouldn't bust your budget. Here's a list of tips you can save money on groceries. When you apply all of them to your daily routine, expect to save hundreds -- or more -- on your next monthly grocery bill. Never leave home without a shopping list. "Without a list, it's easy to buy things just because they're on sale or because it looks yummy," said finance expert Rachel Cruze. "Your list will help you stay on track and avoid buying groceries you don't need and may not even eat." While making that list, it's important to have your meal plan all figured out. If you're known to pick up a few extras on each grocery trip, sticking with your list could very well knock off more than a few bucks. Before you run out the door, make note of what you already have in your kitchen. This should go hand in hand with meal planning and your grocery list. Some things to consider when taking inventory: how many items you have and their expiration dates. You should also make an effort to move the expiring products to the front of the pantry or refrigerator. Forcing yourself to take note of your goods will not save you from buying duplicates and wasting money. The more you have in your shopping crew, the more likely you are to buy beyond what you truly need. A study by the Marketing Science Institute showed 65 percent of cart items were unplanned when people shop in a group, which is an 8 percent increase over shopping alone, reports TIME Money. So if savings is what you're after, leave the kids and spouse at home and fly solo on your next grocery run. Grocery stores are a business and like any business, they have selling tactics to lure a consumer to a higher-priced product. For example, some stores tactfully place higher-priced items at eye level. It's a well-known industry trick. So, what's your best bet? Look high and low, and more often than not you'll find the better deals, equating to a few dollars here and there on every trip. Music does so much for your well-being, but it can also persuade your spending habits. According to a Reader's Digest report, many stores play music with a slower rhythm, which encourages you to spend more time in the store. Wear headphones, and groove your way to the checkout line with some upbeat tunes. You've likely heard it before, but going grocery shopping with an empty stomach is a bad idea. Those growls could be calling out for food you don't necessarily need. Do yourself a favor, and shop on a content stomach. Your wallet will thank you. It likely goes without saying, but the more you shop, the more likely you are to overspend. Shopping is very tempting, and it's certainly more fun to spend than to just gaze. Save yourself money and the hassle of another trip by doing it all in one trip, which could very well cut $10 just like that. When you go grocery shopping, you're likely only buying items that you need right now. However, there should be special circumstances when you buy beyond what you need today, this week or even this month. For example, say you go grocery shopping once a week and there is something you know you'll need on an upcoming camping trip in two weeks. When you go into the supermarket, you find that item is on sale. Instead of waiting until next week to buy the item, make the exception and buy it now. "Watch for a great sale, combine it with coupons and store offers, and buy in a higher quantity," said Josh Elledge, founder of SavingsAngel.com. You can easily cut 50 percent or more off the things you normally buy shopping this way." It might be convenient to grab something that's ready to go, like a jar of spaghetti sauce, but this convenience typically comes at a higher price. For instance, a jar of spaghetti sauce could easily cost a few dollars, but a can of tomatoes might cost under a $1. Be thrifty with your money on your grocery trips, and you'll easily see your dollar savings turn into $20 or more any given month. "When you buy fresh items that are in season, it doesn't typically cost as much money," said Cruze. It's true. To save on food, buy what's in season now. Your receipt will reflect a good chunk of savings. Cruze also recommends adjusting your recipes to fit the time of year. When you can, go generic -- there's a big window for savings. "Canned goods, dried pasta, cereal, baking staples like flour and sugar, and even spices are good examples of generic or store brands that are just as good as name brands," said Andrea Woroch, a consumer and money-saving expert. And nowadays, every big box store has its own brand, which is usually half the cost. According to Woroch, this strategy can save you 30 to 50 percent on your grocery bill. Frozen fruit and vegetables could save you big bucks if you can't buy fresh. Plus, they can make for some great meals. And, as Woroch points out, March is National Frozen Food Month, "so look for deep discounts on frozen produce and meals, and stock up on your family's favorites as manufacturers will be providing lots of coupons at this time on frozen foods and meals like pizza and produce." If you take into consideration these items are already a fraction of the cost -- plus the extra coupons -- you could experience a savings overload that might translate into a Benjamin or two. "Manager markdowns offer savings of up to 50 percent off on meat, poultry and fish nearing its expiration date," said Woroch. "Plan your meal around these manager markdowns, then cook what you want to eat right away, and freeze the rest for later so it doesn't spoil." Although convenient, it's typically not best to buy everything at the grocery store. Batteries, cooking supplies and greeting cards are just a few of those items. "Batteries are cheapest at warehouse club stores or big box stores like Target, while cooking tools can be found for less at discount stores like HomeGoods or Walmart," said Woroch. "For greeting cards, go no further than the dollar store to find 50-cent options to save anywhere from $2 to $4 a pop." Cutting these from your grocery list lets you focus on the main event -- food -- while saving you more than a pretty penny. You can't have one without the other, so you also need to know "when" to buy. And timing is everything. "Paper goods, for instance, like toilet paper and paper towels are on sale the first and third week of the year at grocery stores nationwide," said Woroch. "Also, Wednesdays are the best day to shop for food as this is when most supermarkets release new circulars, ensuring you have the first pick of the top deals." Woroch added that stores typically also honor last week deals, so you'll likely have bonus sale items to choose from as well. Pre-sliced watermelon or chopped veggies could very well cost you several dollars more than if you did the cutting and slicing yourself. The smarter choice to save on food is to buy your produce whole and cut it up when you get home. Plus, pre-cut produce has a shorter shelf life, so if you don't use it up, you're not only paying more -- you're also throwing money away. And that's a definite no-no to saving on groceries each month. Jarred spices can be a terrible return on your money, according to consumer savings expert, Mike Catania. A better bet is to get your spices from the bulk bin instead of those tiny little jars. According to the Bulk is Green Council, bulk foods can cost up to 89 percent less than packaged foods -- which can hold true for spices, too. Stores typically run all sales on a cycle. According to Tracie Fobes of PennyPinchinMom.com, you should create a way to follow these sales (sometimes called creating a "price book"). "This will allow you to stock up on those staples to carry you from sale to sale," she said. Learn the sale cycle, and you can very easily slash your grocery bill in half. Were you planning to make chicken enchiladas to find chicken is not so decently priced? Be ready change plans. Why not make cheese enchiladas instead? On the days you haven't quite prepped with coupons or watching sales, know you can still save yourself several dollars here and there by changing up your meal plan. The "sell by date" doesn't always mean the product will go bad by then. And, it also doesn't mean that the price is final. So if you see something approaching its sell by date, why not beat the store to the punch by asking for the discount first? You might be surprised how much they knock off the price or offer you in coupons. If you're not already budgeting what you'd like to spend, start doing so now. What you'll save on groceries might surprise you. "Make a budget every month before the month begins, and decide how much you need for groceries," said Cruze. "Withdraw this amount in cash from your bank account, and put it in an envelope labeled 'groceries.' This will help you keep track of how much money you've spent and how much you have left for the month." Savings could easily be hundreds each month. Strategy is key to saving on groceries. So when you have coupons for items you use, make use of them. Lisa Sims, author of "Digital Coupon Savings 411," said, "When Publix has its weekly sales, people should focus on using their coupons on the items that are on sale BOGO (buy one get one free) to maximize their savings." Timing your coupons with already great deals is a win-win for your pocketbook, saving you up to 50 percent or more. While you're surfing the net, why not see what extra savings exist before your next grocery run? You can locate specific brand coupons online through sites like CouponSherpa.com or PromoCodeWatch.com. For example, when she performed a search, Woroch found $3 off Tide PODS from Kroger, $1 off any two boxes of Cheerios and $1 off any one-pound package of Jennie-O turkey breast. And just like that, you have $5 in savings. "You can even find savings for fresh produce, like cucumbers, using healthy offers grocery coupons," added Woroch. People can miss the biggest savings when it comes to coupons. But if you can master combining them, you can really make the magic happen, said Elledge. "If the coupon says it is a store coupon, you can also use a manufacturer's coupon on that same purchase," he said. "That's because the store is paying for the additional discount. This is called coupon stacking." Many manufacturers coupons can also be used with a store incentive or offer -- like "$5 off instantly when you purchase five participating products." And when you combine these multiple savings, you can potentially save 70 percent to 90 percent, or even run into free items, said Elledge. Sometimes, technology is the best bet to locate the best deals, which isn't always an easy task. Jill Cataldo, founder of the nationally-syndicated newspaper column "Super-Couponing Tips," recommends Flipp -- a free app that gathers all of the store circulars in your area in one easy-to-use space. "Use it to plan your weekly grocery trips, and you'll enjoy its coupon-matching feature too, which automatically points out additional discounts available on what you're buying at the supermarket," she said. "You can save 20 percent to 70 percent off each item by using the app, which can add up to hundreds of dollars over the year." There are many apps that offer great cash-back deals, such as Ibotta, MobiSave and BerryCart. A family could very easily save $20 or more a month. These types of apps reward people with cash or even gift cards when people buy specific products. Typically, all you need is to send in images of your grocery receipt and voila -- you just made a few bucks. Grocery stores want to have returning customers -- that's why they offer loyalty programs. 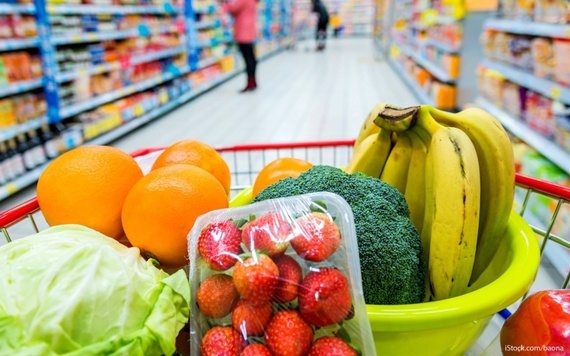 Find out which supermarkets offer these programs before your next shopping trip. Savings might be instant or future coupons, and the benefits could easily save $20 or more per shopping trip. For example, the Amex EveryDay and the American Express Premier Rewards Gold Cards both have 2x multipliers, which means you can earn twice the points for every dollar you spend at U.S. grocery stores. Another option is a cash-back credit card. American Express has the Blue Cash EveryDay, which gives consumers 3 percent cash back on supermarket purchases in the U.S. According to a recent study by the Natural Resources Defense Council (NRDC), the average American family throws out 25 percent of the food and beverages they buy -- that can be up to $2,275 per household a year. So, if you stop wasting food based on this estimate, you can potentially save nearly $190 a month. "No matter how cheap the food was, it becomes the most expensive ingredient when it gets tossed," said Woroch. Eliminate food waste by carefully planning your meals using recipes with the same ingredients so there is nothing to waste, suggested Woroch. So if you buy a whole sack of potatoes, find creative ways to use every potato -- baked potatoes, homemade fries, etc. -- before it goes bad. Also, get in the habit of just eating your leftovers. Lasagna anyone? Another sure way to save money on food -- and avoid waste -- is to cook in bulk. Woroch recommends preparing meals in large quantities and freezing leftovers for later, which can make for easy last-minute meals. "These large portions can be used as lunch for parents, an afternoon snack for teens or as a ready-made dinner for kids when you're short on time," she said. She also recommends designating one day a week to meal prep. Try a black bean burger instead of a hamburger, Tofurky instead of turkey, chick'n strips instead of chicken strips ... you get the drift. There are countless meatless options that cost less and are still full of protein. Some bulk items at warehouse stores might not really be the best value, said Benjamin Glaser, features editor with DealNews. "You're already out the cost of membership fees, and then you feel obliged to 'get your money's worth' and 'avoid return trips' by buying a lot," said Glaser. "Plus, buying in bulk always seems like a good deal. But if you check the unit price, you might not always be getting a discount. Of course, buying in bulk can offer the opposite effect, depending on what you buy, such as toilet paper and diapers. But eliminating unnecessary, money-sucking bulk purchases can easily save you $10 or more each visit. Sometimes, the best way to save on groceries is to avoid the grocery store. You just might be surprised by what you can find at places like the Dollar Store, for example. From dry goods, paper plates, cards and more, you might just find some goods are cheaper than the regular store. Of course, it's always best to do your research and look at the per-unit cost first before heading out. Need more milk? Sometimes the best place to pick up a jug of milk is at the drugstore, Teri Gault, founder of TheGroceryGame.com, told Reader's Digest. According to Gault, milk could cost 30 cents to 50 cents less per gallon. While it might not sound like much, all that nickel-and-diming could turn into dollars of savings in no time. A grocery receipt can tell you a lot about your shopping habits. Collect them and see where you spent the most. If there's anything you can change or substitute, do it. For instance, maybe you bought a 16-ounce container of Greek yogurt but didn't finish that week. Maybe next week you'll want to spend less and purchase the smaller size. You can save several dollars at least just by doing this with every receipt. This article, 35 Ways to Save Hundreds on Groceries, originally appeared on GOBankingRates.com.